Hue Photo Tours design this kind of tour to take you to the best site of the central Heritage Vietnam. Central Vietnam package tour includes Standard Accommodation in Hue and Hoi An, Hue Imperial Capital, Hoi An Ancient Town. One of the most interesting of this tour is Imperial Citadel, Thien Mu pagoda-Heaven Lady Pagoda, Tu Duc tomb, Khai Dinh Tomb, Hoi An Old Town… Besice that on the way traveling to Hoi An, you’ll get a great chance to visit many famous places such as Lang Co beach, Hai Van pass, Marble Mountains … and taking some great photo for your trip. As on arrival at Phu Bai airport, Hue Photo Tours driver and tour guide will pick up and transfer to hotel in Down Town of Hue. Have welcome dinner on dragon boat on Perfume River in the evening with Hue local meal. Overnight at New Star hotel in Hue City. 08:00 – 8:15 Pick up at your hotel, visit to Dong Ba Market to see the daily life of local people, Boat trip to Thien Mu pagoda – The oldest pagoda in Hue city, Imperial Citadel – The home of Vietnam’s last royal dynasty, the Nguyen Dynasty (1802 – 1945). Next stop is Hue Royal Antiques Museum – A collection of ornaments from the Nguyen’s dynasty. Have lunch at local restaurant then visit to Incense stick village, Minh Mang Tomb, Khai Dinh Tomb. 17:30 Back to your hotel. Overnight at New Star Hotel. Evening spend your time walking around Hue by night or swimming at Hue New Star Hotel. 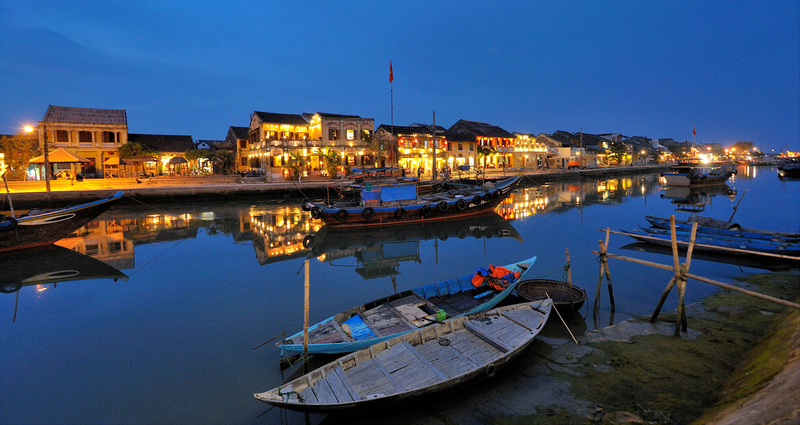 8:30 Hue Photo Tours’s tour guide and driver will pick you up from your hotel lobby in Hue and depart to Hoi An city. We stop to see the scenic fishing village Lang Co Beach. Lang Co beach attracts visitors with its stunning white sand beaches and crystal blue water. After passing Lang Co beach, we drive for 20km on Sea cloud pass – Hai Van Pass – One of the highest pass in the country. It’s one of the most scenic and historic hillside roads in Vietnam. We stop to visit Cham Museum – The Museum of Cham Sculpture in Danang houses Vietnam’s most extensive collection of artefacts from the Cham civilization that ruled over central and southern Vietnam for centuries. Lunch is prepared in a local restaurant. We will reach your hotel around 2:00pm. Check in Phu Thinh Boutique Resort in Hoi An. 8:30am Pick up from your hotel in Hoi An, we spend the morning or afternoon for a walking tour around this enchanting port town. Follow the narrow lanes lined with centuries-old houses influenced by Chinese, Japanese, French and European architectures and visit its numerous places of interest: the 400-year old Japanese Covered Bridge, the Phuc Kien Assembly Halls, the local fish market… Around the town we can see a numerous art galleries and tailor shops, get some made-to-order clothes if you are interested. Have lunch at local restaurant for Hoi An Speciality. Back to the hotel. Trip end. Free time exploring Hoi An Town. Our driver will meet you at hotel lobby then transfer to Danang International Airport by private car. End of service and see you again! Inclusion: A/C private car transfer as itinerary, Meals and mineral water, English speaking tour guide, Entrance fees (From 1st Apr- Entrance fees in Hue city has been increasing), Boat trip on Perfume River, New Star Hotel or similar Superior DBL/ TWIN – Upgrade Deluxe room surcharge US$5 per person, Phu Thinh Boutique Resort in Hoi An – or similar Superior DBL/ TWIN – Upgrade Deluxe room surcharge US$5 per person. Exclusion: Personal expenses, Tips and Gratuities, Travel insurance, Single Supplement: US$ 35, Connecting family rooms are available on request. No need deposit, pay after end tr. Book now!